The Sanyo Electric Works was founded in 1947 by Toshio Iue, in Osaka, Japan. The first product was a tiny electricity generator for bicycle lamps, running off the side wall of the tyre. In 1950 the Sanyo Electric Co., Ltd. was established, and in 1952 started production of a plastic-bodied radio, the first of many household appliances that were ro be manufactured under the Sanyo name. Sanyo launched its first electronic calculator in 1966, and became a pioneer in the development of calculators using integrated circuits. 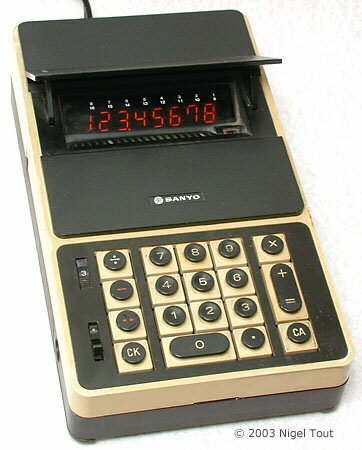 In 1968 the journal Electronics said that Sanyo was the first Japanese company to use shift registers (using MOS - Metal Oxide Semiconductor) in a calculator for register and memory functions. Later in that year it said that Sanyo had exhibited two calculators "built around Motorola large-scale-integration packages. Sanyo intends to switch to domestic LSI packages as soon as Japanese semiconductor producers offer them." The development problems with the ICs delayed the introduction of the miniature hand-held calculator, probably till late 1970. 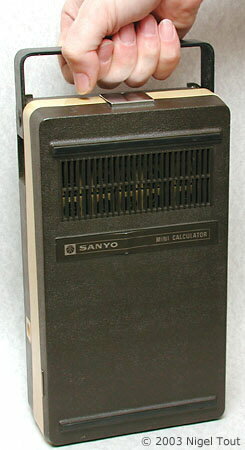 Sanyo was then never quite at the forefront of calculator development. The miniature calculator emerged as the Sanyo IC-0081 Mini Calculator, using integrated circuits marked with the "GI" logo of General Intruments Microelectronics of the U.S.A. It was followed by the IC-82 and a large number of other hand-held models through the 1970s. In September 1969 Electronics reported "Japan's Sanyo Electric Co. is seeking government approval of a licensing arrangement reached with General Instrument Corp. Under the arrangement, Sanyo will at first import and then manufacture the U.S. firm's metal, thick-oxide nitride silicon LSI circuits for use in the Japanese company's new miniature desk calculator. The calculator is expected to go on the market early next year. Terms of the 10-year licensing arrangement call for General Instrument to receive an $80,000 initial payment and a 3.25% royalty. Although Sanyo will be allowed to sell the LSI circuits separately, the company didn't win an exclusivity clause. Sanyo is investing $4.17 million in new production facilities to manufacture the circuits. Domestic production is expected to start in June; the company's initial goal is 70,000 circuits. The calculator itself has been redesigned so that each machine will require only four or five LSI circuits." This model was launched in 1971 and is one of the first hand-held calculators. Although it is a hand-held model it is large and heavy since it has a built-in charger for the Ni-Cd cells, but was "mini" for the time! A slightly later and slightly smaller Sanyo model, with flip-up display cover and battery-level meter. For further photographs of Sanyo hand-held calculators see the Calculator Photo Library on this site.